Seoul, South Korea (CNN) -- Massive downpours in South Korea -- the heaviest rains in a century -- are blamed for 35 deaths, according to the country's Central Disaster Relief Agency. Heavy rain was still falling Thursday morning across parts of the country. It was raining in some areas around Seoul at a rate of two inches an hour (50 millimeters an hour) and was expected to continue Thursday. The most recent numbers released by the Central Disaster Relief Agency indicated that much of the death toll comes from landslides triggered by the rain. In Chuncheon, 13 people were killed by landslides, while 15 were killed by the same phenomenon in Seoul. Five people were still missing, the agency said. 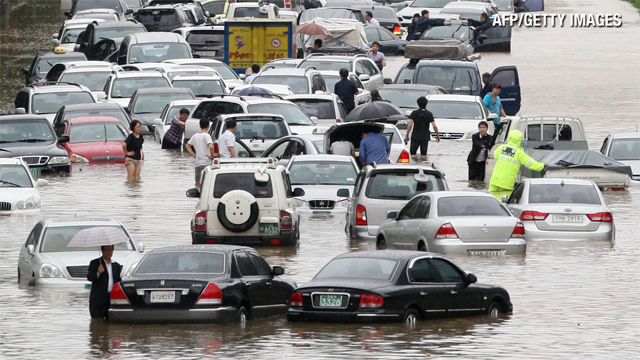 Five neighborhoods on the outskirts of Seoul were under evacuation orders. But officials were able to restore electricity to many thousands of homes that had lost power. Earlier, there were 116,000 homes without power, said the agency. Early Thursday, that number stood at 1,190. Earlier, the agency warned that hundreds of families had lost their homes. The weather caused major traffic disruptions across portions of the country as well. The Korea Meteorological Agency issued a special heavy rainfall alert for cities in the center of the country. The forecast called for the downpour to continue at a rate of 60 millimeters (2.4 inches) per hour over the next day. South Korea typically experiences a rainy season during the summer.